Really? is this appropriate, sneaking onto my daughter’s entertaining blog and inserting a post of my own for her birthday? She’d call it creepy…just like the times when she travels to visit me and I track her progress on iPhone’s flighttrack app. “Creepy” she says. Just being a Mom, I say. 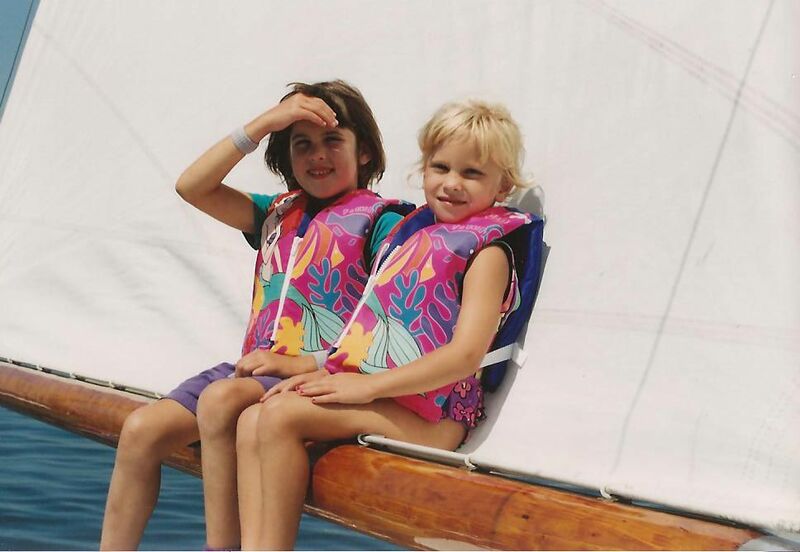 In celebration of Jessie’s 25th, I thought it appropriate to post a few pictures of her earlier days as a sailor. 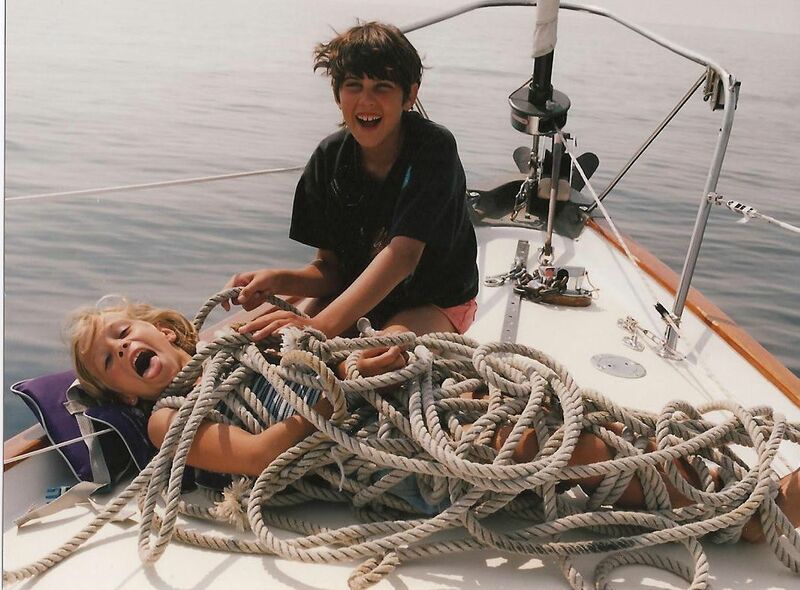 Even as a young child, despite her TOTAL lack of interest in actually learning anything about the mechanics of sailing, the boat was her theatre and her playground. She laughed. She danced. She harassed her sister and was harassed in return. She never sat still. She drove us crazy. She entertained us. She made us cry. She made us laugh. We adored her!! And now, many years later, this accomplished and talented 25-year-young woman and her equally smart best friend,Katie, take off on an adventure that few of us would ever dare to do. Am I worried about her resume? Only if she were silly enough to want to follow in my footsteps and seek a predictably safe and boring corporate job. But Jessie, as you faithful-followers-of-her-blog may have learned by now, is neither predictable nor boring. And I am confident that she will have a joyful life surrounded by friends and family who love her. One last Mom comment, since I’ve already broken the rules by busting into her blog….thanks to all of you who have befriended, supported and watched over these 2 charming girls throughout their adventure. I don’t know you, but bless you. And to Jessie – may you have a most wonderful day on this 25th day of your life. We love you!!! Happy Birthday Jessie! Thanks for the lovely entertainment! So glad I’m not the only one who tracks their children’s flights on the iPhone! Mine lives in Ireland and the trips are infrequent. And for you, mom, you done good. Jessie, HAPPY BIRTHDAY! Be glad you have a Mom that still cares enough to stalk! Tell Mike and Rosie that we said Hi! A very happy birthday Jessie! As your mother well knows, I’ll be 59 this Thursday. Wow! Where have the days gone since your mom & I were windsurfing together on the “big lake” and Bostwick lake? And if you are out there Claire, I sold my shares of the cottage last week Friday. No more ball & chain! Headed to Arizona this Wednesday to look for a winter place. No more of this “winter wonderland” not! Mom, Thank you for the information on Jessie. Jessie is a great writer. We enjoy her stories. We are glad she is doing what she wants before the ball and chain life begins. Mom, thank you for being so supportive of your children. Wish all a very happy life. Happy Birthday, Jessie. I’ve known my best friend since I was 6, nearly 57 years. We also sail together, travel together and our children have known each other practically since birth. I wish you many, many more years with Kate. Friendships like you and I have had are true miracles. Sail on!